Who is this other George that exists again? He was made a new martyr. O the bravery! The Holy New Martyr George, who is also called Paizan, was born on the island of Lesvos, in the village of Plagia near the town of Plomari. He was a tailor by trade in Constantinople. 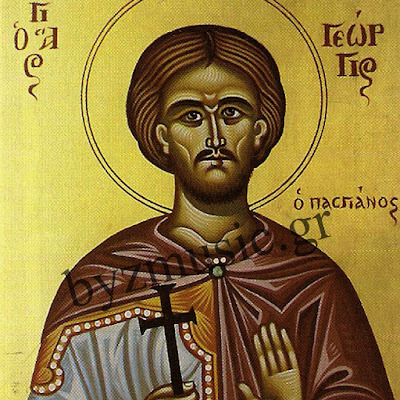 For unknown reasons he was put to death in Constantinople on the 14th of February in 1693, because he refused to abandon his Orthodox Christian faith and submit to Islam. 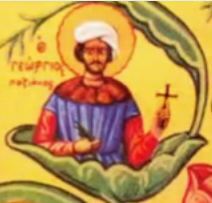 The multitudes of Lesvos be glad and dance, for the all-luminous memory of the Neomartyr George, and honor the firm armed-soldier, who in difficult times contested staunchly, being victorious over beliar, and now in celestial places intercedes on behalf of the faithful who celebrate him.